When you’re getting a manicure, do you ever look at your hands and cringe at the sight of spots, lines, and wrinkles? You are not alone! Plenty of women are self-conscious about the way their hands look—and as the most visible feature after your face and hair, it’s natural to want your hands to look as healthy and youthful as the rest of you. 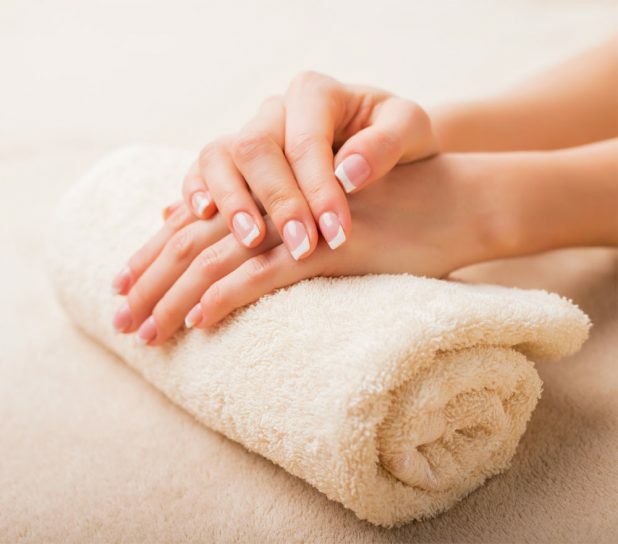 Achieving smooth, flawless hands is easier said than done, especially if you wash your hands repeatedly throughout the day or your hobbies involve playing out in the punishing sun. But that doesn’t mean it’s impossible. We recently came across this article from PureWow outlining the “secrets” of women with pretty hands. Along with using moisturizer and SPF daily and devoting time to cuticle care, the article highlights several other tactics that lead to smoother, softer hands and more attractive nails. While they do have some nice tips, they forgot one key secret to pretty hands you may not know was even an option: a visit to your cosmetic surgeon and aesthetician! If you’re bothered by pronounced lines or a bony appearance, there is something you can do to make your hands look younger: injectable treatments. Yes, you heard that right—dermal fillers are not just for faces. When skillfully injected into the hands, fillers can restore volume, soften fine lines and wrinkles, and reduce the appearance of prominent veins and tendons to help hands look years younger. When skillfully injected into the hands by a qualified provider, fillers can restore volume, soften fine lines and wrinkles, and reduce the appearance of prominent veins and tendons to help hands look years younger. Dr. Pancholi offers multiple filler options for non-surgical hand rejuvenation. Radiesse is FDA approved to restore a more youthful look to the hands for up to 1 year, and our Las Vegas hand rejuvenation patients love the quick, convenient treatment. Bellafill, which lasts up to 5 years, is another great option for patients who desire longer-lasting effects. Whichever option they choose, patients love leaving our office with smoother, more youthful hands! For those who want to try, shorter acting fillers are also available such as Juvederm and Restylane. Popular skin resurfacing options, such as CO2 laser treatments or IPL photorejuvenation, are safe for many patients’ hands, and can be a great way to reduce sun damage, surface scars, and fine lines. If you’re seeking a dramatic improvement, talk to your cosmetic surgeon about fractional lasers, which offer impressive results with a reasonable amount of healing time. Just be absolutely sure any provider you choose has plenty of experience with laser rejuvenation for hands: the skin there is thinner, and lasers must be used with great care. Want to wear your favorite jewelry and show off that manicure with confidence? We can give you a hand! The biggest “secret” we gleaned from the PureWow article—beautiful hands are earned through a proactive approach (meaning, don’t wait until things are too far gone) and consistent use of high-quality treatments and products. These same rules apply for all aspects of beauty care, and one of the easiest and most cost-effective ways to ensure you are doing everything you can to keep your face, skin and hands looking their best is to work with an experienced, qualified aesthetic professional. If you’re interested in non-surgical hand rejuvenation or want to improve your appearance in other ways, contact us. Dr. Pancholi and our Las Vegas Cosmetic Surgery team offer complimentary consultations and will be glad to help you get started on a treatment plan to achieve your goals. Read the full article, 7 Secrets of Women with Pretty Hands, here.